Come out to see us and all the vendors at Pet Palooza 2019!!! Pet Palooza is back! Our annual event will be hosted at a NEW LOCATION and feature a 2k walk along the wide dog-friendly paths of McAlpine Creek Park. Our new location offers ample free parking and a larger area for more vendors! Come out to see us and all the vendors at Race to Rescue 5k!!! Enter to win 1 photo session at 1 location of your choice, 5 digital photos and a FREE 14”x20” canvas print of any of the 5 photos of your choice! We are overwhelmed with excitement to announce our first ever 5K fundraiser! The fundraiser is a collaborative effort between Every Life Matters, Project Safe Pet, and Halfway There Rescue. The proceeds from this event will be used to fund York County’s free spay/neuter program. Currently, our free program prevents thousands of animals from reproducing each year, and with your help, we can help even more animals in 2019! 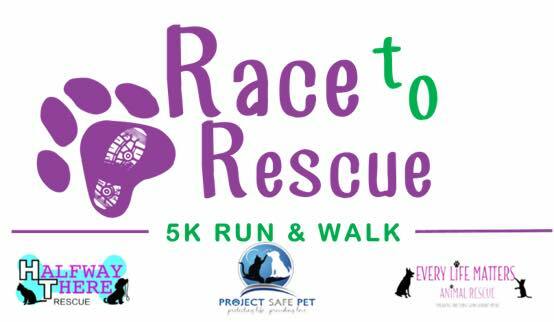 If you are interested in volunteering or sponsoring please email us at RacetoRescue5K@gmail.com. Registration is $30 & includes a T-shirt. $10 for digital photo or a donation of pet food or supplies. The holidays are right around the corner. Come out and bring your pets to get your photo taken with us. While you are there take a look around the Charlotte Restore. You will get one digital photo emailed to you. Portion of proceeds will be donated to Habitat for Humanity. Pet People (Highland Creek) will be hosting various pet related vendors adoptable pets, pet portraits, prizes, games and all the TREATS! Halfway There Rescue presents "Hop, Drop 'n Drool"
Come out to Noda Brewing Co to support a great rescue with their second annual, Hop, Drop ‘n Drool, to raise $10,000! We are giving away a FREE photo session to raffle off at the event. Session includes 1 photo session, at 1 location of your choice, 5 digital photos and you choose 1 out of the 5 photos to be printed on a 14” x 20” canvas. So come out and have some fun while supporting a local rescue! For more info click on links below. Pet adoption weekend at Pet Supermarket, 1408 East Blvd B, Charlotte, NC. Come celebrate National Adoption Weekend at Pet Supermarket on 1408 East Blvd, Charlotte, NC 2017 in Charlotte's Dilworth neighborhood near Freedom Park. Charlotte Black Dogs presents: "Paws in the Park"
Easter pet photos at Pet Supermarket at 3036 Weddington, Sutie 300, Matthews, NC. St Paricks Day pet photos at Pet Supermarket on 1408 East Blvd, Charlotte, NC 2017 in Charlotte's Dilworth neighborhood near Freedom Park. Valentines Day pet photos at Pet Supermarket on 1408 East Blvd, Charlotte, NC 2017 in Charlotte's Dilworth neighborhood near Freedom Park. Valentines Daypet photos at Pet Supermarket on 1408 East Blvd, Charlotte, NC 2017 in Charlotte's Dilworth neighborhood near Freedom Park. Christmas pet photos at Pet Supermarket on 1408 East Blvd, Charlotte, NC 2017 in Charlotte's Dilworth neighborhood near Freedom Park. Halloween pet photos at Pet Supermarket on 1408 East Blvd, Charlotte, NC 2017 in Charlotte's Dilworth neighborhood near Freedom Park. 4th of July Pet Photos! St. Patrick's Day Pet Photos! Christmas Photos with Santa Paws!